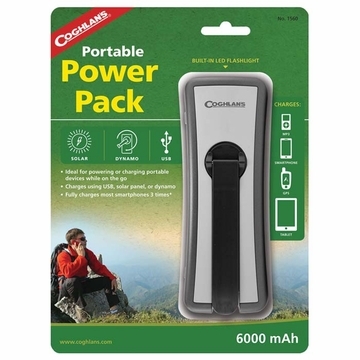 "Portable Power Pack provides power to your smartphone, digital camera or tablet anywhere you go. Never be without power again! Power can be recharged to the device by USB, solar or dynamo cranking. Has built-in flashlight, LED indicators show charge level The Power Pack stores energy in high-grade lithium polymer cells for later use. It has a built-in flashlight, LED indicators show charge level & a durable case that is water resistant. It's small enough that it can be stowed away in your backpack or jacket pocket. 10 min in sun provides 10 min of talk time. 1 min cranking will provide 10 min of talk time. Will charge smartphones with 2000 mAh battery up to 3 times."